Lipoprotein(a) (Lp(a)) is a genetic risk factor for cardiovascular disease (CVD) and is associated with the induction and sustaining of atherosclerotic cardiovascular diseases (ASCVD). Since 2008 Lp(a) along with progressive CVD has been approved as an indication for regular lipoprotein apheresis (LA) in Germany. The German Lipoprotein Apheresis Registry (GLAR) has been initiated to provide statistical evidence for the assessment of extracorporeal procedures to treat dyslipidemia for both LDL-cholesterol (LDL-C) and Lp(a). The GLAR now allows prospective investigations over a 5-year period about annual incidence rates of cardiovascular events. Here Lp(a) patients (LDL-C < 100 mg/dl; Lp(a) > 60 mg/dl or >120 nmol/l) showed the same reduction of major coronary (83%) and non-coronary events (63%) as had been formerly shown in the Pro(a)LiFe study. However, Lp(a) is not only an apolipoprotein(a) (apo(a)) and LDL-C containing particle, which is covalently bound to a LDL-C core by a disulphide bridge. The composition of this particle, inter alia containing oxidized phospholipids, gives pro-atherosclerotic, pro-inflammatory, and pro-thrombotic properties, inducing atherosclerotic processes mainly in the arterial wall. However, recent investigations have shown that a reduction of inflammatory settings without LDL-C or Lp(a) reduction may reduce ASCVD events. Lipoprotein apheresis (LA) could not only reduce LDL-C and Lp(a) in parallel, but also different inflammatory and coagulation parameters. 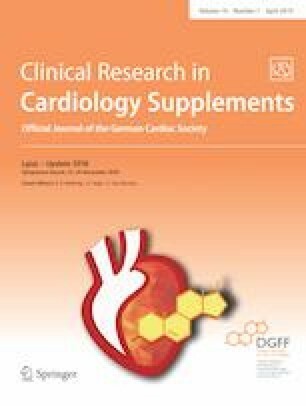 In summary lipoprotein apheresis is not only anti-atherosclerotic, but also anti-inflammatory and anti-thrombotic and therefore an ideal treatment option with respect to the shown reduction of major adverse coronary events (MACE) and major adverse non-coronary events (MANCE) by reducing Lp(a) levels. Atherosclerotic cardiovascular diseases (ASCVD) are the main cause of morbidity and mortality in western countries . Since 2009 multiple investigations have provided more evidence that Lp(a) is an independent risk factor . This evidence was obtained from genetic, Mendelian randomization, and epidemiologic investigations [2, 3]. Lp(a) is complex due to its composition of a low-density lipoprotein cholesterol (LDL-C) particle, in which apolipoprotein B is covalently bound to apolipoprotein(a), which contains different kringles with various characteristics . These structures are responsible for its pro-atherosclerotic, pro-inflammatory, and pro-thrombotic properties, inducing ASCVD or calcific aortic valve stenosis (CAVS) . Therefore, because of the different compositions Lp(a) properties are not similar or comparable to LDL. Consequently, drug-induced Lp(a) reduction might be less successful than could be shown for LDL-C.
Until now, little is known about the effect of reducing Lp(a) and the outcomes with respect to the development and progress of ASCVD or CAVS . In the last few decades a lot of investigations could not differentiate between the effect of Lp(a) and LDL-C on atherosclerosis development due to ineffective LDL-C-lowering therapies. The demand for a therapy is increasing because of the knowledge that Lp(a) can induce early ASCVD or CAVS independently of LDL-C levels . Whereas statins are discussed as increasing Lp(a) levels , some investigations showed a reduction of Lp(a) induced by nicotinic acid . However, a reduction of major cardiovascular events (MACE) could not be shown for nicotinic acid. Due to the negative results of the Atherothrombosis Intervention in Metabolic Syndrome with low HDL/HIGH Triglycerides (AIM-HIGH) trial, nicotinic acid has been withdrawn from the German market . The monoclonal antibodies to proprotein convertase subtilisin/kexin type 9 (PCSK9) alirocumab and evolocumab reduced LDL-C by up to a mean of 60–70% from baseline, which corresponds to a reduction of MACE [9, 10]. In addition, both PCSK9 inhibitors (PCSK9i) showed a reduction of Lp(a), 20–30% in low or moderate Lp(a) levels <50 mg/dl (<120 nmol/l), but less than 20% in higher Lp(a) levels . Although outcome studies for both PCSK9i exist, data showing a reduction of Lp(a) corresponding to MACE reduction are not available until now. Since 2008 Lp(a) accompanied by progressive cardiovascular disease has been approved as an indication for lipoprotein apheresis (LA) in Germany. The term “progressive cardiovascular disease” was not clearly defined by the Federal Joint Committee (G-BA), the highest decision-making body of the joint self-government of physicians, dentists, hospitals and health insurance funds in Germany. Members of the German Apheresis Working Group filled the gap: LA therapy is indicated, when high Lp(a) levels (>60 mg/dl (120 nmol/l)) in combination with normal LDL-C levels (<100 mg/dl (<2.6 mmol/l)) induced untypically early cardiovascular damage . In addition, LA may be also indicated when at a particular time the atherosclerosis process is in such an advanced state that further progress will be life-threatening or fatal. In this situation LA therapy is the only therapeutic way to achieve significant Lp(a) reduction and a better prognosis. However, the Canakinumab Anti-inflammatory Thrombosis Outcomes Study (CANTOS) has provided convincing evidence of interleukin-1 beta as a target, whose neutralization by a selective antibody reduces major cardiovascular events without affecting LDL-C or Lp(a) levels . This provides strong evidence in support of the inflammation hypothesis and will certainly stimulate research in this area and open the way for novel therapy in high-risk patients following myocardial infarction. Recent investigations have shown that a reduction of inflammatory settings without LDL-C or Lp(a) reduction may reduce ASCVD events . The LA procedure could not only reduce LDL-C and Lp(a) in parallel, but also various inflammatory and coagulation parameters [15, 16]. In a recent publication of the Pro(a)LiFe study, the 5‑year prospective follow-up results confirm that LA has a lasting effect on prevention of cardiovascular events in patients with increased Lp(a) levels . For this issue a database query of the German Lipoprotein Apheresis Registry (GLAR) was performed to verify the findings from the Pro(a)LiFe study . The latest database query for this publication was performed in April 2018. All data were collected in the time period 2012–2017 and analyzed using the statistics software SigmaStat (SigmaStat 4.0; Systat Software Inc., San Jose, CA, USA). Additionally, patient data were analyzed with respect to incidence rates of major coronary events (MACE) and major non-coronary events (MANCE) 2 years before and prospectively 2–5 years after initiation of LA treatment. This current data pattern gives the optimal sample size for statistical evaluation. For this investigation, a specific data term for Lp(a) patients’ selection was created: Lp(a) > 60 mg/dl (>120 nmol/l); LDL-C < 100 mg/dl (<2.6 mmol/l). MACE was defined as an outcome parameter i. e. cardiovascular death, nonfatal myocardial infarction, coronary bypass surgery, percutaneous coronary intervention, or stent, whereas MANCE was determined as non-cardiovascular events i. e. stroke, carotid percutaneous transluminal angioplasty or carotid surgery or peripheral vascular events (peripheral vascular event of lower extremities or renal arteries with percutaneous transluminal angioplasty, stent, bypass surgery, amputation), or venous thrombotic events like deep venous thrombosis or pulmonary embolism. The access, database, quality, entries, queries, and evaluation of the German Lipoprotein Apheresis Registry (GLAR) were described previously . Data of more than 26,977 LA treatments of 1632 patients were entered into GLAR, mostly 1 to 2 treatments per quarter. All required data are available for each patient as the design of the entry form requires complete data collection. From 2012 to 2017, 79 German apheresis centers collected retrospective and prospective observational data of 1632 patients undergoing LA to treat high LDL-C levels and/or high Lp(a) levels, who were suffering from progressive cardiovascular disease (CVD). Analog to the pattern of the Pro(a)LiFe study, Lp(a) patient data (Lp(a) > 60 mg/dl (>120 nmol/l); LDL-C < 100 mg/dl (<2.6 mmol/l) were analyzed with respect to incidence rates of major coronary events (MACE) 2 years before and prospectively for 2–5 years undergoing chronic LA treatment. Patients with available data according to the query pattern in the period 2012–2017 were found to have a reduction in MACE of 83% (Fig. 1a). The same query scheme was applied for major non-coronary events (MANCE) (Fig. 1b). An average reduction rate of MANCE of 63% was observed. Now there is more evidence that elevated Lp(a) levels may contribute to ASCVD and CAVS. Although Lp(a) isoform-independent assays are available, it is still being discussed, which Lp(a) measurement method is the gold standard, and consequently which units (mg/dl or nmol/l) Lp(a) should be given in [5, 19]. Furthermore, a clear linear association of Lp(a) levels and the risk for ASCVD is missing, which could be measured in patients with different LDL-cholesterol (LDL-C) levels. With respect to the given uncertainty of Lp(a) measurement it may be useful that levels should not be given in metric units but in qualitative statements like normal level and cardiovascular risk, or high level and increased risk for ASCVD. However, based on interaction with genetic, epidemiological, translational, and pathophysiological insights, Lp(a) is established as an independent genetic, and likely causal risk factor for ASCVD and CAVS . In a broad spectrum of patients these observations are consistent across risk factors and concomitant therapies. Until now there is a huge demand for reducing Lp(a), but no investigations using lipid-lowering drugs had shown that further cardiovascular events (CVE) could be reduced. Statins tend to increase Lp(a) levels, but it is never been investigated if this effect is clinically relevant. Recently approved proprotein convertase subtilisin/kexin-type 9 inhibitors (PCSK9i) and mipomersen lower Lp(a) 20–30%, and RNA-targeted therapies lower Lp(a) levels >80% . But these approaches have not been tested in clinical outcome trials. A current investigation demonstrates for PCSK9i again an impressive LDL-C reduction and a minor Lp(a) reduction when Lp(a) > 80 mg/dl (>200 nmol/l). But this persistent small decrease of Lp(a) may have contributed to the observation that lipid lowering by PCSK9i did not lead to a reduction in arterial wall inflammation . Lipoprotein apheresis (LA) therapy is with respect to Lp(a) levels only indicated when high Lp(a) levels (>60 mg/dl (120 nmol/l)) in combination with normal LDL-C levels (<100 mg/dl (<1.8 mmol/l)) induced progressive cardiovascular damage. The acute decrease of Lp(a) levels by LA is impressive, mostly more than 70% after LA treatment. Prevention of cardiovascular complications in patients with high Lp(a) and progressive cardiovascular disease by long-term LA was shown in the Pro(a)LiFe investigation. From the first year under chronic LA treatment the MACE and MANCE rates could be reduced significantly. This early CVE reduction was not shown in any other lipid-lowering drug investigations with respect of high Lp(a) levels and ASCVD. However, the recent database interrogation of GLAR using nearly the same Pro(a)LiFe study settings confirm these important findings and showed a similar and constant reduction of MACE and MANCE in Lp(a) patients undergoing regular LA for up to 5 years of treatment. But how could these impressive findings be explained? Lp(a) can be a major pro-inflammatory, pro-thrombotic, or atherosclerotic risk factor . Individuals might start developing an atherosclerotic process due to other risk factors like high LDL-C levels, hypertension, smoking, or chronic inflammatory diseases like rheumatoid arthritis. Furthermore, the immune system plays a crucial role in the progression and modulation of atherosclerosis [23, 24]. T cells that respond to autoantigenic components of LDL or Lp(a) particles orchestrate plaque development . Many connections between the immune system and metabolism exist; acute inflammation induces hypertriglyceridemia , whereas chronic inflammation in the arterial walls has more complex effects, like in rheumatoid arthritis . Novel approaches such as anti-inflammatory therapies like the CANTOS trial [13, 14], T‑cell-based treatments or vaccination against LDL or Lp(a)  could potentially reduce cardiovascular inflammation and protect against the development of atherosclerosis [29, 30, 31]. In addition cell–cell communication is important to maintain the inflammatory settings . Because of the human individual immune reactivity to high levels of LDL-C or Lp(a) the difference of atherosclerotic lesion development may be explainable, e. g. in some cases high levels of Lp(a) induce no, in other cases moderate Lp(a) levels fulminate ASCVD. However, it is becoming more and more evident that LA could not only reduce LDL-C or Lp(a) levels (Fig. 2). LA improves whole blood viscosity and endothelium-mediated vasodilation, and has a positive effect on the hemorheological composition, improving perfusion in the microcirculation . Recently in a randomized controlled cross-over trial in patients with refractory angina and increased Lp(a) levels, myocardial perfusion, atheroma burden, exercise capacity and symptoms were found to be improved with LA treatment . In addition LA changes the plasma inflammatory profile and the cytokine pattern in patients with severe dyslipidemia, which may correspond to the early reduction of MACE and MANCE in Lp(a) patients [15, 17, 35, 36]. 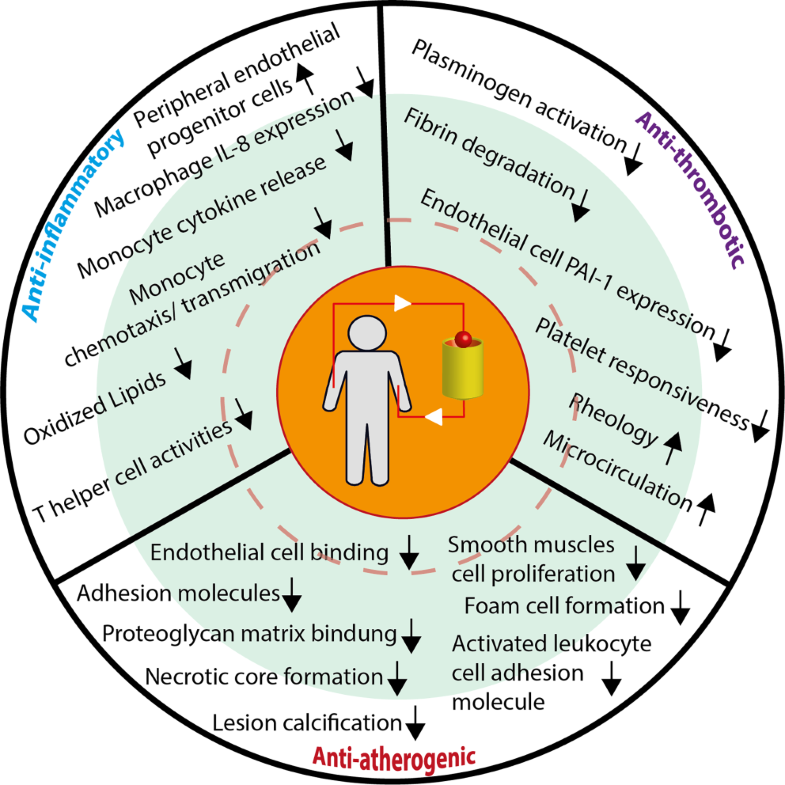 Because of its assumed long circulation in the arterial vessels Lp(a) contains pro-inflammatory oxidized phospholipids (OxPL), which induce monocyte trafficking to the arterial wall and mediate pro-inflammatory responses through its OxPL content . In patients undergoing regular LA decreased OxPL levels could be determined after treatment . Elevated Lp(a) could be also involved in atherothrombotic disorders. Lp(a) influences different coagulation factors resulting in thrombus formation . Patients suffering from thrombophilia Lp(a) may aggravate the coagulation situation, leading e. g. to placenta-mediated pregnancy complications resulting in early miscarriages [39, 40]. 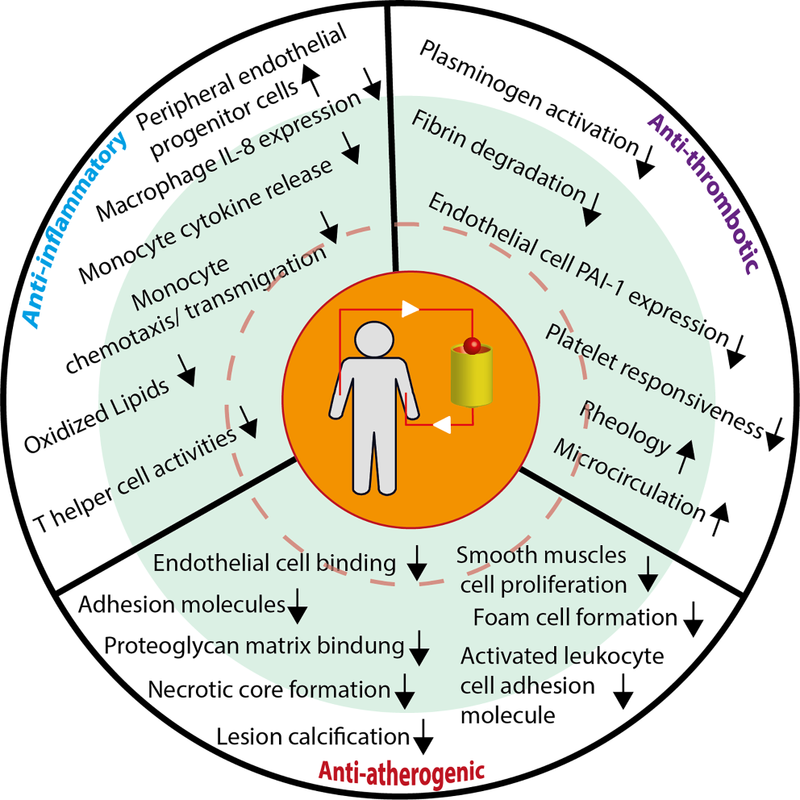 In summary regular LA treatment may break the vicious circle of atherosclerosis induced by Lp(a) because of its multifactorial influence on this pathophysiology (Fig. 2). LA is therefore anti-atherosclerotic, anti-inflammatory, anti-thrombotic, and consequently an optimal therapeutic option to reduce increased Lp(a) levels. The authors appreciate the dedicated help and time of the colleagues and members of the scientific board of GLAR, Germany: A. Vogt (Munich), B.R. Jaeger (Mühlheim), F. van Buuren (Oelpe), K.P. Mellwig (Bad Oeynhausen), H.U. Klör (Gießen), P. Grützmacher (Frankfurt), E. Roeseler (Hannover), U. Julius (Dresden), B. Hohenstein (Villingen-Schwenningen), F. Heigl (Kempten), H. Blume (Düsseldorf), R. Klingel (Köln), and V.J.J. Schettler (Göttingen). V.J.J. Schettler, C.L. Neumann, C. Peter, T. Zimmermann, U. Julius, B. Hohenstein, E. Roeseler, F. Heigl, P. Grützmacher, H. Blume, R. Klingel, A. Vogt declare that they have no competing interests.